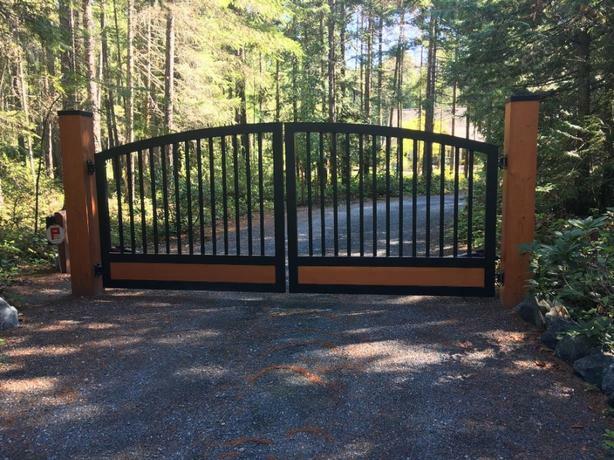  Log In needed $1,990 · Aluminum Driveway Gates -"Westcoast Custom Gates Ltd"
Westcoast Custom Gates Ltd - "Custom, Innovative a Designs"
Vancouver Island's Largest Manufacturer and Installer of Automated Driveway Gates! We have a warehouse full of prefabricated driveway gates in stock and ready to go! Professional Gate & Automation Installation Available! Aluminum Construction, 4"x2" Frame, 1.5"x 5/8" Pickets, Bottom Opening Fits 8" Wood Board (board not included), "Sandtex Black" Powder-Coated Finish. Automated Gate Systems, Posts, Hardware, Accessories and Installation of All of Our Products Available! Check Out Our Website For Other Available Designs and Pricing, Or Please Contact Us For More Info!